L-R, Newly wed couple Christopher Thomas and Princess Ruth Komuntale, Tooro King Oyo Nyimba Kabamba Iguru and the queen Mother Best Kemigisa pause for a picture after the royal wedding at St. John’s Cathedral in Fort Portal. PHOTO BY RACHEL MABALA. In minutes after, Christopher Thomas and Tooro Princess Ruth Komuntale were declared husband and wife. Then joy spread like a gentle tremor through the entire congregation. Outgoing Church of Uganda Archbishop Henry Luke Orombi who was in control of the royal wedding performed the matrimony with perfect eloquence at the great St. John Cathedral in Fort Portal. But this did not stop the colourful ceremony from bringing together politicians, diplomats, African traditional leaders, religious leaders and the business community, among others. There was fanfare and pomp. Everything, from the floral arrangement to the bridal entourage, oozed glamour. The groom, Thomas, 30, had arrived at the church at 11am in company of his mother, Alicia Thomas, his brother William Thomas who was the best man, and Mr Katenta Apuuli. 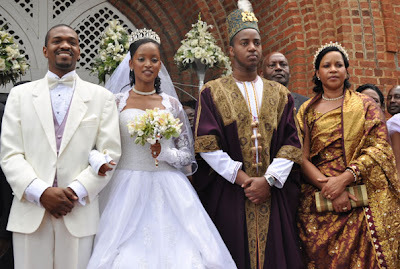 By noon, both Komuntale and Thomas had said “I do” after the Princess was formally escorted to her husband by the brother and King of Tooro, Oyo Nyimba Kabamba Iguru. Archbishop Orombi advised the groom to love his wife, no matter the changes that may come with time and age. “Ruth will demand your time, your money and your love,” he said. Museveni represented President Yoweri Museveni, who is a Crown Defender in the Tooro Kingdom, was unable to attend but was represented by Vice President Edward Ssekandi. Other VIPs included Prime Minister Amama Mbabazi, Speaker Rebecca Kadaga, Gen. Elly Tumwine, Nabagereka Sylvia Naginda, and Buganda Prime Minister JB. Walusimbi. Cultural leaders from Benin, Ghana, Swaziland, Kenya, Bunyoro and Ankore were also in attendance. A grand reception (kwinura) was held at the Karuzika palace, where all guests and the people of Tooro (Emyenda ya Tooro) were hosted by King Oyo.